I remember making pineapple upside down cake a long time ago when I was a kid and thinking it was so cool - back then anything that you baked and then flipped out of the pan was pretty impressive. It still makes me pretty happy and impressed when I can flip something and everything comes out right without sticking or falling apart. These little cupcakes are no exception - you layer the butter and brown sugar in the bottom of a well-greased muffin tin. 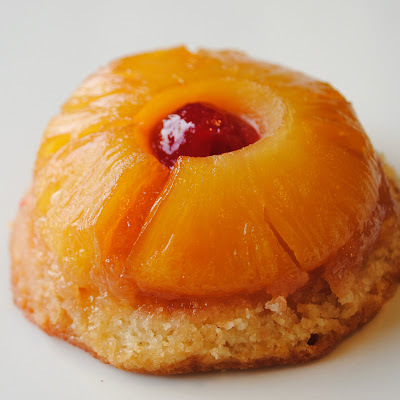 Add in the pineapple and a maraschino cherry and then top with yellow cake batter. Bake them up and then its time for the reveal. Flip the pan over onto a platter or a parchment lined cooling rack and take off the pan. The cupcakes should be adorable little stacks of goodness, the brown sugar and butter melt into a sticky glaze and caramelize the pineapple. These aren't as convenient as traditional cupcakes because if you bake them up in cupcake liners, you don't get the effect of the pineapple and syrup and it just looks like an unfrosted yellow cake. They don't really dome up like most cupcakes either (which is good when you want to flip them). To make them portable, I set them upside down on a cupcake liner. You could also put them in small boxes if you were doing them as a favor. These are definitely best served the day you bake them or the next day at the latest since there is no frosting to keep the cakes from drying out. Preheat oven to 350 degrees. Spray a 12-cup muffin pan with baking spray or grease with butter. Drain the pineapple, reserving the juice for the cake batter. Combine brown sugar and melted butter in a small bowl. Evenly divide among each of the muffin wells, about one teaspoon per well. 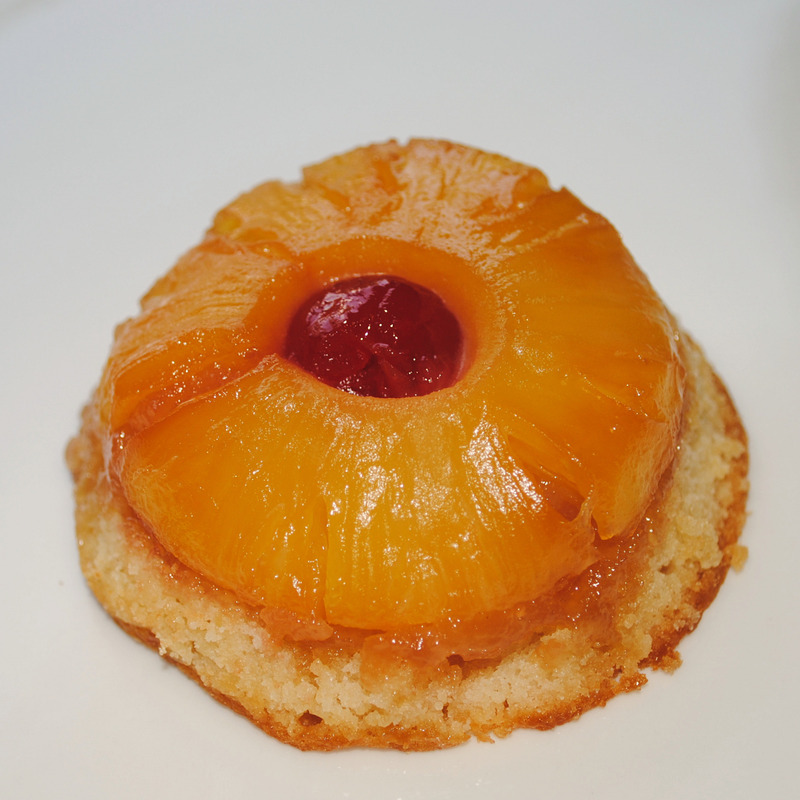 Cut about 1/3 out of each pineapple ring and arrange rings over the brown sugar mixture. Add a cherry in the center of each ring. In a mixing bowl, combine flour, sugar and baking powder. Add butter, pineapple juice and vanilla and beat on low until just combined. Increase speed to medium and beat two minutes. Add the egg and beat in until well incorporated. Evenly divide the batter among the muffin wells, filling each about 3/4 of the way full. Bake approximately 25-30 minutes until a toothpick inserted in the center comes out clean. Cool the cupcakes five minutes in the pan and then flip onto a platter or covered rack. Cool and serve. Those are absolutely adorable - look delicious! 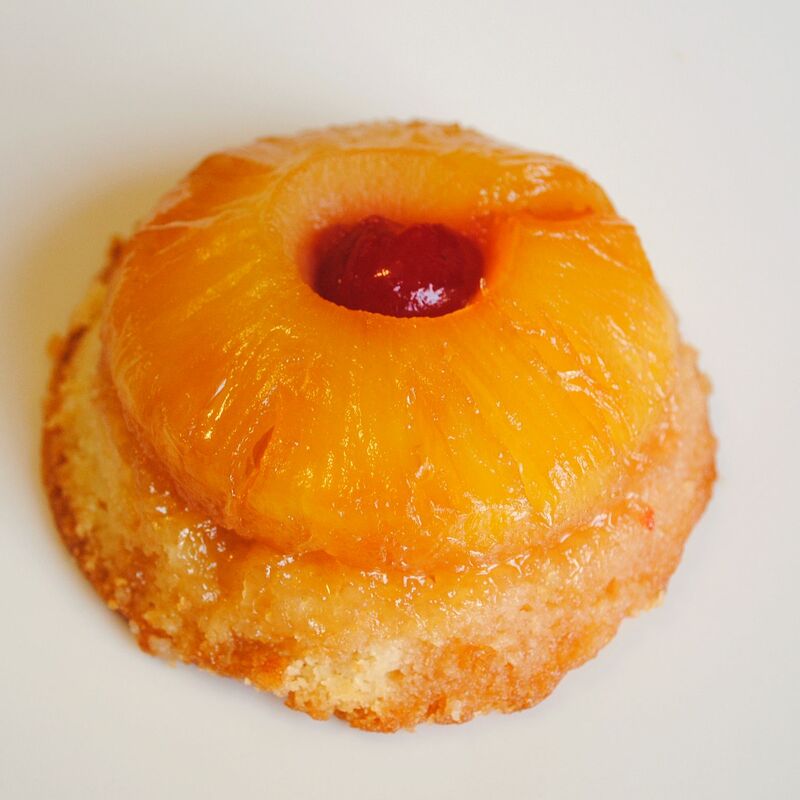 Ive bookmarked this recipe and made it yesterday.Delicious!Thanks for sharing this recipe! Can someone tell me if the white flour can be substituted with whole wheat flour? Thanks in advance for the advice. While I haven't done it with this particular recipe, I have found I have better luck substituting 1/2 whole wheat flour / 1/2 regular flour in baked goods in the past. I would also guess that white whole wheat flour would tend to have better texture in something like a cupcake. I found your recipe and can't wait to make this cake.